The Epic Games Store is picking on steam…well everything that Steam use picked up for PC release as Quantic Dream announces that three of their top titles are on their way to the platform. Detroit Become Human, Beyond Two Souls and Heavy Rain will all be arriving on PC in 2019. 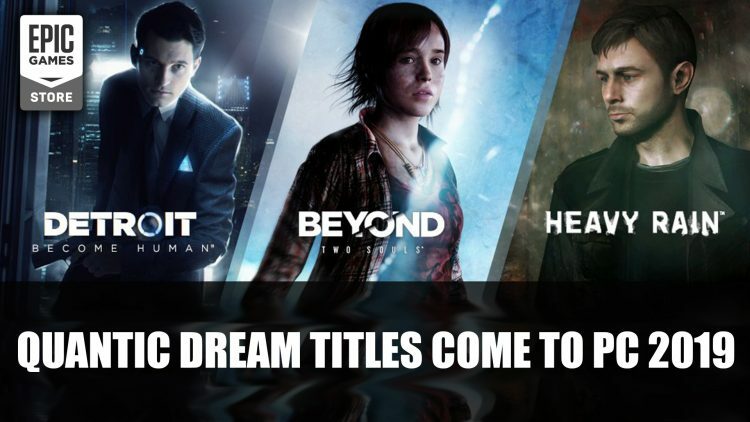 These Quantic Dream titles were previously only released on PS3 and PS4 as they were published with Sony Interactive Entertainment, but now for the first time they are coming to PC via the Epic Games Store. So grateful for twelve fantastic years of collaboration with Sony Interactive Entertainment and all they have allowed us to create and produce. The most important evolution for Quantic Dream, however, is that we are no longer a developer working with a publisher. Starting with the PC versions of Heavy Rain, Beyond: Two Souls and Detroit: Become Human, we will be self-publishing all our titles. It was earlier this year when online gaming company giant NetEase made a minority investment into the company, meaning Quantic could expand from Playstation exclusive releases to more platforms in future. This definitely bringing a shake up to the PC gaming platform as Epic Games has been snapping up timed exclusives with such upcoming titles as The Outer Worlds and Phoenix Point. This has even led developers to specifically announce whether or not they are planning to choose certain platforms for their launch, which is what CD Projekt Red the developer of Cyberpunk 2077 did. Titles Detroit Become Human, Beyond Two Souls and Heavy Rain will be coming to PC via the Epic Games Store later this year. For more Epic Games news be sure to read next The Outer Worlds To Launch On Epic Games Store And Windows Store and Epic Games Store Development Roadmap Covers Wishlists, Cloud Saves And More. You can also check out X-COM Creator Receives Backlash From Backers As It Becomes An Epic Games Store Exclusive.